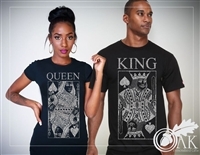 King and Queen Tshirts. Spades trump everything. As a power couple, imagine all things that you'll trump "together". T's are decorated in silver glitter on a solid black tshirt. $6.50 shipping will be added at checkout for 2 shirts. Contact OOak for better shipping rates. 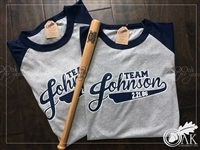 $5 additional for size 2x and larger Mr & Mrs Baseball Jersey by Champion. What team are you on? If you're married, we're sure you're a part of a great team already. These baseball jersey's let you show off your big day. Please give us: 1)Wedding date. 2) His name. 3) Her name. 4) Year. $5 additional for size 2x and larger Mr & Mrs Wedding / Anniversary Tshirts. Designed with Glitter for the Mr & Mrs, but we've added a few crystal clear rhinestones for the Mrs. Shirts available in Black or white, Vnecks or Crew Cut. 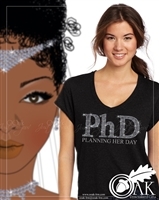 PhD (Planning Her Day). This PhD will require a lot of hard work and dedication. Hopefully, on "Her Day" you'll graduate with Honors. Available in Black Crew Neck or V-Neck. Contact OOak directly for other color options.